Mixpanel, Google Analytics and Facebook Insights were all telling the same story. The amount of traffic on mobile browsers went from 20% to nearly 40% within just a few months. While there was an option to donate on mobile browsers the design was an afterthought which was reflected through the data. After speaking with 10 different people in a user study we declared assumptions as to why mobile donation conversions were underperforming. Users were not able to fully connect with the cause given the lack of visibility to the photo and story. Many of the testers seemed hesitant to donate, and fearful that their credit card information was not safe. Post donation sharing had little to no engagement given the number of options presented. A social crowd funding platform for causes. At the beginning of our sprint, we started with clarifying the goals of the new design, and began sketching some ideas to improve the mobile experience. From there I created wireframes of the best ideas. Through usability tests, interview reviews and a few iterations we were able to come up with a final design that was ready for production. The were the major changes we made. 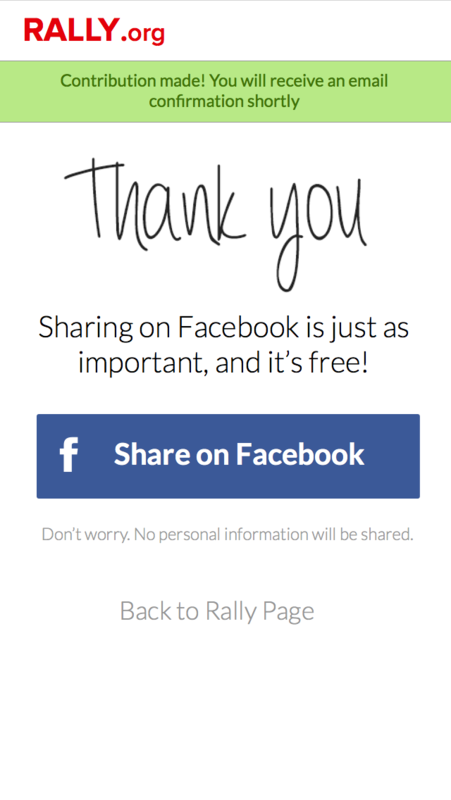 Personalized the post donation page and increased the exposure of Facebook sharing over other options. Mobile donation conversion increased 25% for iPhone and Android browser. Within weeks we saw both mobile traffic and donations increase double given the usability improvements and attention to Facebook sharing.